(PDF version of this document). Electrical malfunctions account for 7,100 fires totaling over $207 million in non-residential building loss in 2016 according to the USFA. The NC Fire Code prohibits the use of electrical hazards that could contribute to a building fire or an electrical shock injury. Use a UL-listed, grounded surge protector instead of a simple power strip. 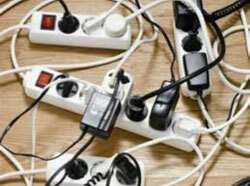 A surge protector will cost more but protect your electronics from power spikes. To identify the difference, look for the energy rating on the package and the protected light on the device. 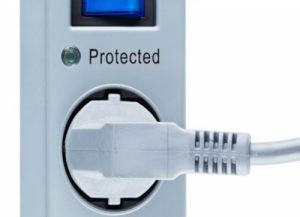 Surge protectors must be plugged directly into the wall and are not to be used in conjunction with extension cords or daisy-chained together. The device is not designed to handle that much electricity. Additionally, plug appliances and space heaters directly into wall outlets. Extension cords are not a substitute for permanent wiring. Choose the correct gauge and length cord when one is needed. 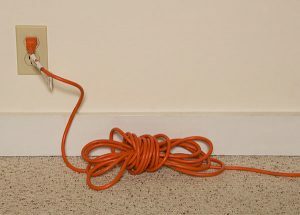 No extension cord can pass through a door, ceiling, wall, or under furniture. A damaged cord is dangerous so inspect them often. For more information or guidance contact EHS Fire Safety at 919-962-5507 or e-mail firesafety@unc.edu.